Old Fire Station #3, 1217 Williamson, Built 1902, photographed just before removal in 1954. New station #3 at1217 Williamson, photographed in 1965. Mike Fuss, who presented to our group on “Firefighting on Madison’s East Side” grew up on Dahle Street a few blocks from Fire Station No. 8 on North St. He spent his childhood “chasing fires” and collecting toy fire trucks and “firemen” figures. 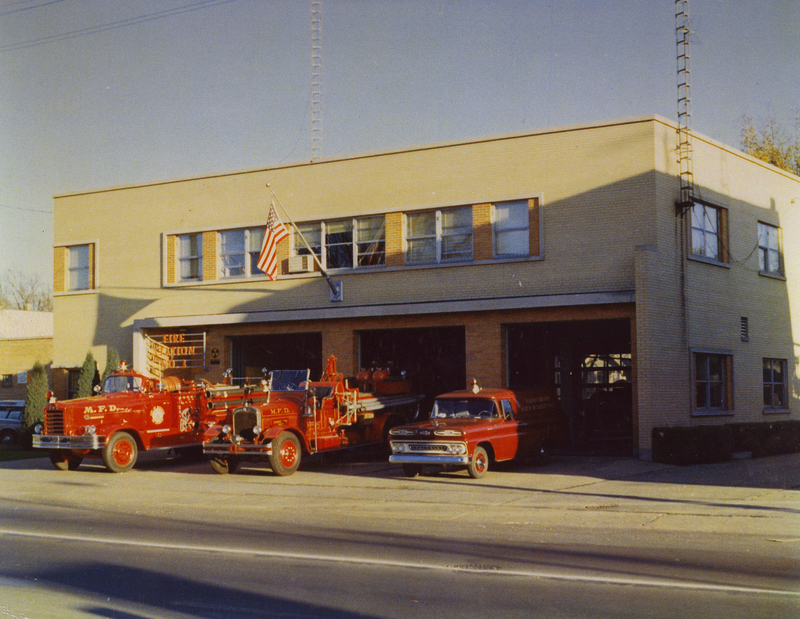 Mike joined the Madison Fire Department in 1969 and began to collect fire fighting memorabilia, fire-fighting gear and full-size fire trucks, especially those items related to the history of the Madison Fire Department. His interest became so apparent that the Madison Fire Department named him its official historian. He co-authored a book in 1992 on the history of the Madison Fire Department titled Capitol City Courage (which is in the Madison Public Library with the call number: 352.30977583 C172c ) and started publishing a newsletter and hosting get-togethers for retired firefighters. He retired from the Fire Department in 2000. When he learned that the Fire Department was going to sell Fire Station No. 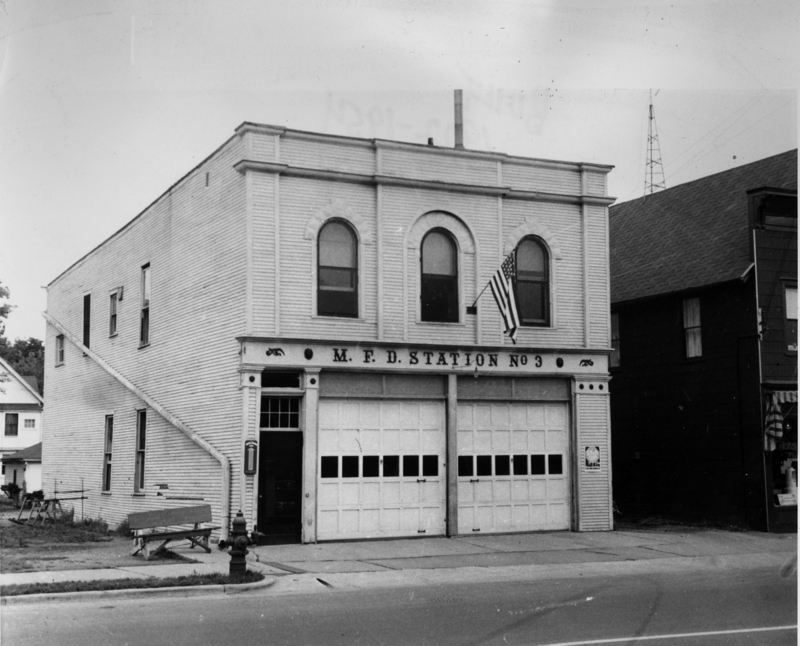 8 on North Street after the crew moved into new fire station on Lien Road and Parkside Drive near EastTowne Mall, he put in a bid of $41,000 to buy the building, proposing to live upstairs and convert the first floor into the Madison Firefighting Museum. His dream came true in 1900. He now lives in the Clyde “Bud” Chamberlain Memorial Building and Firefighting Museum, honoring his uncle who was the Dane Co. coroner killed in the City-County Building in 1988. If you are seriously interested in seeing his collection and talking to him about the Madison Fire Department you can contact him at 244-6732. 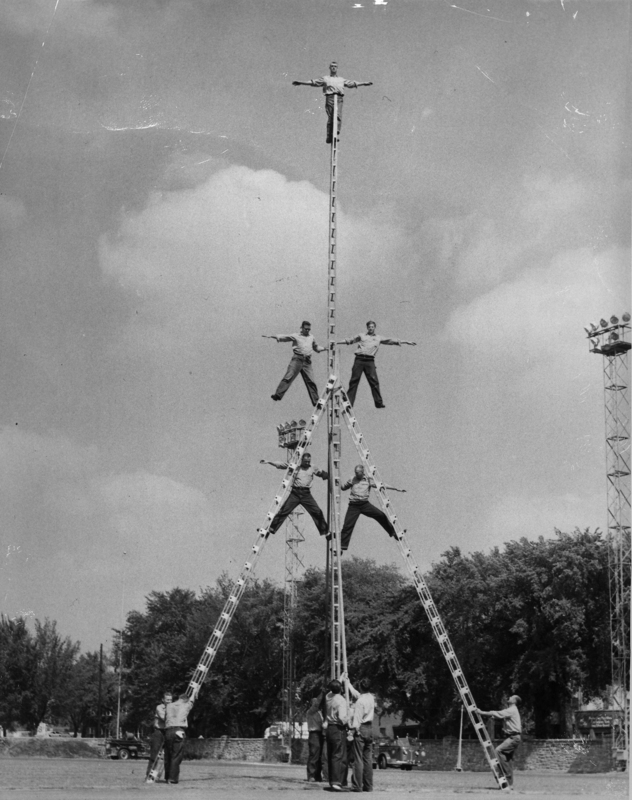 Police and firemen exhibit their prowess at the Police and Fire Show, 4th of July, 1948. 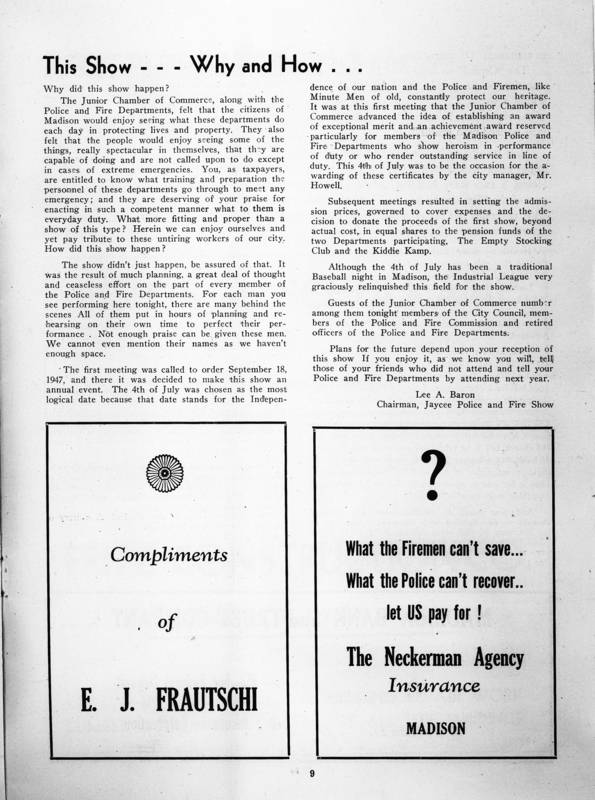 Madison Junior Chamber of Commerce sponsored the Police and Fire Show on the 4th of July, 1948 in Breese Stevens Field. We want your photos of these East Side Landmarks! Looking for more photos like this one! 2) Go “walkabout” in your neighborhood with a good camera and send us photos of these places today. With beautiful Fall weather ahead, now is the time to go on an East Side Landmark photo safari. Send digital photos or scans to whitesarah@charter.net. If you have a photo but need it scanned, send an email to that address. Look for photos and stories about these places to appear on this blog in the future, and thanks in advance for your help! Smith House out at 5301 Milwaukee St.
Heistand School, 4418 MIlwaukee St.
Stang-Wirth House, 2817 Milwaukee St.
Garver Feed & Supply, 3244 Atwood Ave.
St Bernard’s Church, 2450 Atwood Ave.
Corry Carriage House, 2906 Lakeland Ave.
Riley House, 2930 Lakeland Ave.
Loftsgordon House 2429 Center Ave.
Mills Folly, 2709 Sommers Ave.
Dean House, 4718 Monona Dr.
Boutell House, 4522 E. Buckeye Rd. Gisholt, 1245 E. Washington Ave.
Did you or a relative go to an East Side School? We’re planning a presentation on Emerson School for our November 2011 meeting. Memories of Emerson and other schools welcome here! When Joan Phalen was doing some research for the East Side History Club in the Dane County Register of Deeds Office she met Peter Ellestad, who works there. Peter said that his mother Maxine Hynum went to Hawthorne School and that he had a picture of her and her classmates enjoying a milk break in the kindergarten class ca. 1924. Maxine Hynum is the girl under the window sipping from her bottle of milk. At the time, she and her family lived at 2213 E Washington Ave.
Maxine Hynum and classmates enjoying a milk break in the Hawthorne School kindergarten class ca. 1924. In 1859 the Township of Madison established the Northeast District School to serve that area of the town of Madison as well as the northwest area of the town of Blooming Grove. It was located on the north half of lots 25 & 26 of Farwell’s Eastern Addition, i.e. 220 Division St. By 1871 there was a small red brick building on the site and eventually it became known as the Dunning School, for Philo & Sophia Dunning who had a farm and house (still standing) nearby, 2212-2216 St. Paul Ave. In December it was reported that “the new school house, a modern 4-room building, is accommodating the vast number of children in fine style. The little ones were very glad to get into the new quarters. 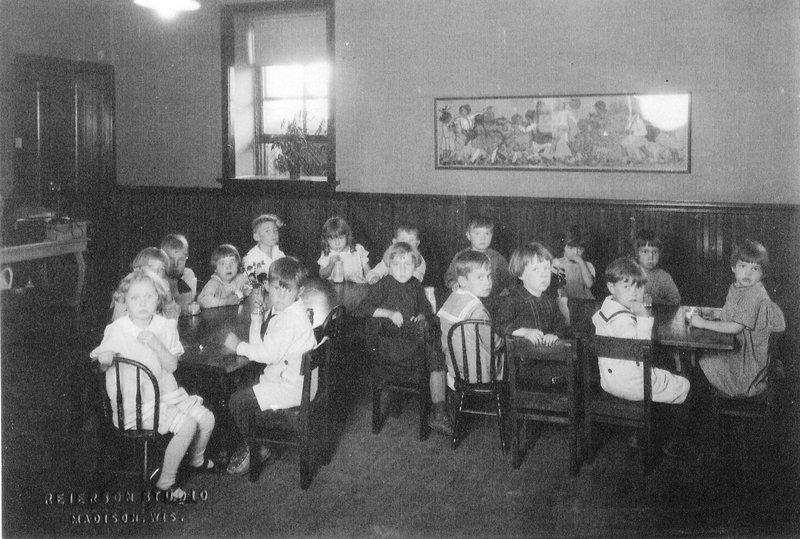 The thanks of the public are extended to Fred Schenk for granting the use of his new hall for school purposes but a school in a hall over a store is not always desirable but the little folks behaved themselves nicely.” Another 4 room were added in 1905. In 1904 the Madison school district accepts a recommendation from the Madison Woman’s Club to rename several Madison schools including the Northeast/Dunning School which became Nathaniel Hawthorne School. Lowell (1916) & Emerson (1920) schools were built to accommodate the growth on the “northeast side” but still Hawthorne school had to use the old Fair Oaks village hall, 175 Talmadge Street, as an annex. When Marquette and Lapham schools were built and opened in 1940, Hawthorne School was torn down and the site became a small neighborhood park.